"March attendees are always overwhelmingly Catholic, but this year an influx of evangelicals will be joining them on the Mall." Read more about "March attendees are always overwhelmingly Catholic, but this year an influx of evangelicals will be joining them on the Mall." "Groups from 15 states have formally launched the new Personhood Alliance . . . a Christ-centered grassroots organization whose focus is life from beginning to end . . . the goal is to educate on and promote legal protection for all innocent human life." 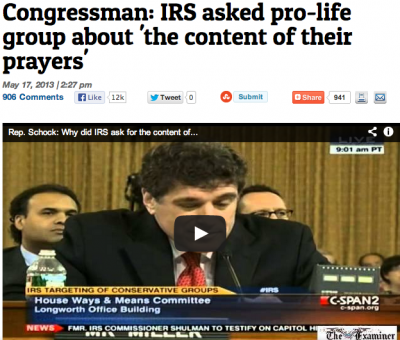 IRS questions Coalition for Life of Iowa 501 c3 applicant: "detail the content of the members of your organization’s prayers"
Read more about IRS questions Coalition for Life of Iowa 501 c3 applicant: "detail the content of the members of your organization’s prayers"
Editor’s Note: This article is reprinted with permission from Doug Kutilek’s free newsletter “As I See It,” a monthly electronic magazine, and appears here with some editing. AISI is sent free to all who request it by writing to the editor at dkutilek@juno.com. The perpetrator fled the scene. A suspect, alleged to be the assassin, was apprehended in the Kansas City area (where he lived) less than four hours later and was returned to Wichita where he was subsequently charged, along with other crimes, with first degree murder. Under Kansas law, this offense does not carry the death penalty. Though I never met George Tiller, I once met his father, Dr. Jack Tiller, who had a family practice at Oliver and Kellogg in east Wichita back in the 1960s and early 1970s. In high school and for a time in college, I was an afternoon delivery driver for a small pharmaceutical company and occasionally made deliveries to Jack Tiller’s office. When Jack Tiller died in a plane crash in the early 1970s (I don’t recall the precise year), George, not long out of medical school, came to Wichita to take over his father’s practice. This development was close in time to the Roe v. Wade Supreme Court ruling that opened the floodgates to American infanticide. 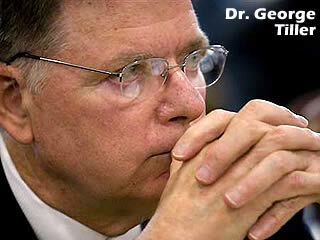 I don’t know if George Tiller ever practiced any kind of “medicine” other than abortion. If so, he soon abandoned it, and the whole of his practice was dealing death to the unborn in cooperation with the mothers of these innocents.